Orion is striding proudly across the meridian as darkness falls, but, even before the twilight dims, we have our best chances this year to spot Mercury low down in the west and close to the more familiar brilliant planet Venus. 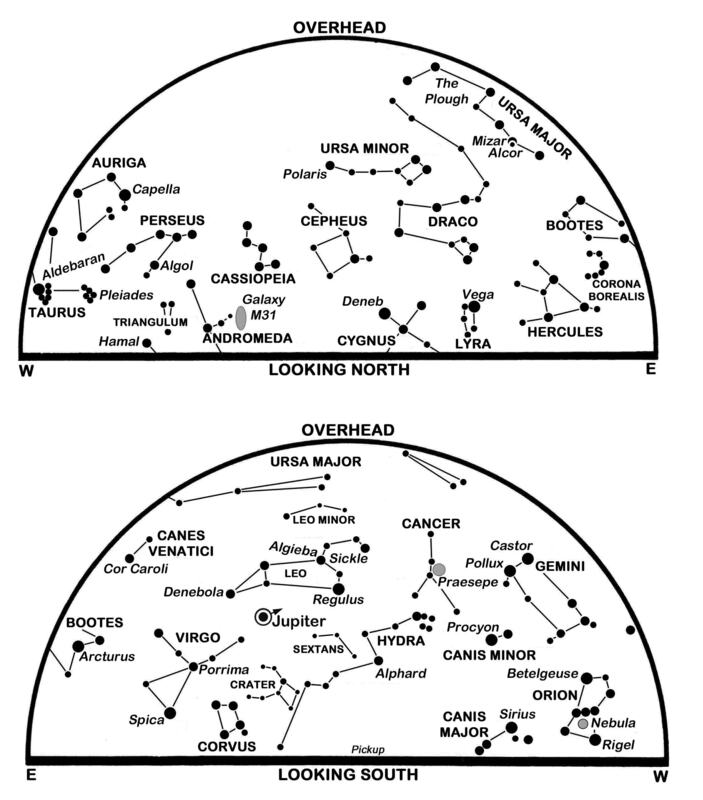 Both evening stars lie within the same field-of-view in binoculars for much of March, so the fainter Mercury should be relatively easy to locate using Venus as a guide. Provided, of course, that we have an unobstructed horizon. Mercury never strays far from the Sun’s glare, making it the most elusive of the naked-eye planets – indeed, it is claimed that many astronomers, including Copernicus, never saw it. Blazing at magnitude -3.9, Venus hovers only 9° above Edinburgh’s western horizon at sunset on the 1st and sets 64 minutes later. Mercury, one tenth as bright at magnitude -1.3, lies 2.0° (four Moon-breadths) below and to its right and may be glimpsed through binoculars as the twilight fades. Mercury stands 1.1° to the right of Venus on the 3rd and soon becomes a naked eye object as both planets stand higher from night to night, becoming visible until later in the darkening sky. By the 15th, Mercury lies 4° above-right of Venus and at its maximum angle of 18° from the Sun, although it has more than halved in brightness to magnitude 0.2. The slender young Moon sits 5° below-left of Venus on the 18th and 11° above-left of the planetary pairing on the 19th. Earthshine, “the old Moon in the new Moon’s arms”, should be a striking sight over the following few evenings. On the 22nd, the 30% illuminated Moon creeps through the V-shaped Hyades star cluster and hides (occults) Taurus’ leading star Aldebaran between 23:31 and 00:14 as they sink low into Edinburgh’s west-north-western sky. Falling back towards the Sun, Mercury fades sharply to magnitude 1.4 by the 22nd when it passes 5° right of Venus and becomes lost from view during the following week. At the month’s end, Venus stands 15° high at sunset and sets two hours later. The Sun climbs 12° northwards in March to cross the sky’s equator at the vernal equinox at 16:15 on the 20th, which is five days before we set our clocks forward at the start of British Summer Time. Sunrise/sunset times for Edinburgh change from 07:04/17:47 GMT on the 1st to 06:46/19:49 BST (05:46/18:49 GMT) on the 31st. The Moon is full on the 2nd, at last quarter on the 9th, new on the 17th, at first quarter on the 24th and full again on the 31st. Orion is sinking to our western horizon at our star map times while the Plough, the asterism formed by the brighter stars of Ursa Major, is soaring high in the east towards the zenith. To the south of Ursa Major, and just reaching our meridian, is Leo which is said to represent the Nemean lion strangled by Hercules (aka Heracles) in the first of his twelve labours. Leo appears to be facing west and squatting in a similar pose to that of the lions at the foot of Nelson’s Column in Trafalgar Square. Leo’s Sickle, the reversed question mark that curls above Leo’s brightest star Regulus, outlines its head and mane and contains the famous double star Algieba whose two component stars, both much larger than our Sun, take more than 500 years to orbit each other and may be seen through a small telescope. Regulus, itself, is occulted as they sink towards Edinburgh’s western horizon at 06:02 on the morning of the 1st. Jupiter, easily our brightest morning object, rises at Edinburgh’s east-south-eastern horizon at 00:47 GMT on the 1st and at 23:41 BST (22:41 GMT) on the 31st, climbing to pass around 17° high in the south some four hours later. Brightening from magnitude -2.2 to -2.4, it is slow moving in Libra, being stationary on the 9th when its motion reverses from easterly to westerly. Jupiter is obvious below the Moon on the 7th when a telescope shows the Jovian disk to be 40 arcseconds wide. If we look below and to the left of Jupiter in the south before dawn, the three objects that catch our attention are the red supergiant star Antares in Scorpius and, further from Jupiter, the planets Mars and Saturn. Mars lies in southern Ophiuchus, between Antares and Saturn, and is heading eastwards into Sagittarius and towards a conjunction with Saturn in early April. The angle between the two planets falls from 17° to only 1.5° this month as Mars brightens from magnitude 0.8 to 0.3 and its distance falls from 210 million to 166 million km. Mars’ disk swells from 6.7 to 8.4 arcseconds, becoming large enough for surface detail to be visible through decent telescopes. Sadly, Mars (like Saturn) is so far south and so low in Scotland’s sky that the “seeing” is unlikely to be crisp and sharp. Incidentally, on the morning of the 19th Mars passes between two of the southern sky’s showpiece objects, being a Moon’s breadth below the Trifid Nebula and twice this distance above the Lagoon Nebula. Both glowing clouds of hydrogen, dust and young stars appear as hazy patches through binoculars but are stunning in photographs. Saturn, creeping eastwards just above the Teapot of Sagittarius, improves from magnitude 0.6 to 0.5 and has a 16 arcseconds disk set within its superb rings which span 37 arcseconds at midmonth and have their northern face tipped towards us at 26°. The waning Moon lies above-left of Mars on the 10th and close to Saturn on the 11th. Times are GMT until March 25, BST thereafter. This is a slightly revised version, with added diary, of Alan’s article published in The Scotsman on February 28th 2018, with thanks to the newspaper for permission to republish here. Stargazers will be hoping for better weather as Orion and the stars of winter depart westwards in our evening sky, Venus dives into the evening twilight and around the Sun’s near side, while all the other bright planets are on view too. Indeed, Venus has the rare privilege of appearing as both an evening star and a morning star over several days, provided our western and eastern horizons are clear. Orion still dominates our southern sky at nightfall as Leo climbs in the east and the Plough balances on its handle in the north-east. The Sun’s northwards progress and our lengthening days mean that by nightfall at the month’s end Orion has drifted lower into the south-west, halfway to his setting-point in the west. 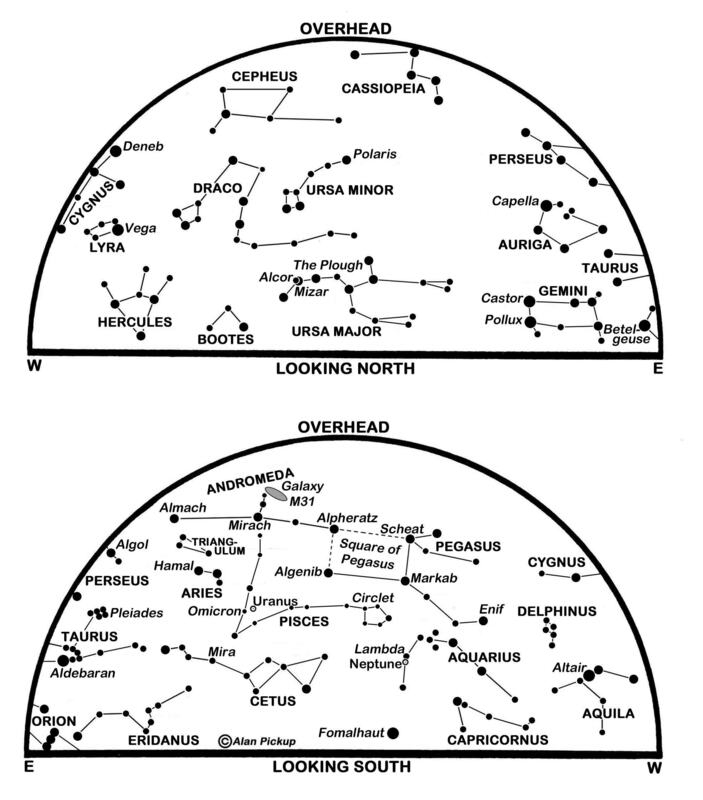 He is even lower in the west-south-west by our star map times when it is the turn of Leo to reach the meridian and the Plough to be almost overhead. Leo’s leading star, Regulus, sits at the base of the Sickle of Leo, the reversed question-mark of stars from which meteors of the Leonids shower stream every November. The star Algieba in the Sickle (see chart) appears as a glorious double star through a telescope. Its components are larger and much more luminous than our Sun and lie almost 5 arcseconds apart, taking some 510 years to orbit each other. The pair lie 130 light years away and are unrelated to the star less than a Moon’s breadth to the south which is only half as far from us. The Sun travels northward across the equator at 10:28 GMT on the 20th, the moment of the vernal (spring) equinox in our northern hemisphere. On this date, nights and days are of roughly equal length around the globe. Sunrise/sunset times for Edinburgh change from 07:04/17:47 GMT on the 1st to 06:46/17:49 BST (05:46/18:49 GMT) on the 31st after we set our clocks forwards to BST on the morning of the 26th. The lunar phases change from first quarter on the 5th to full on the 12th, last quarter on the 20th and new on the 28th. Look for the young earthlit Moon well to the left of the brilliant magnitude -4.6 Venus on the 1st when telescopes show the planet’s dazzling crescent to be 47 arcseconds in diameter and 16% sunlit. Venus’ altitude at sunset plummets from 29° in the west-south-west on that day to only 7° in the west on the 22nd as its diameter swells to 59 arcseconds and the phase shrinks to only 1% – indeed, a few keen-sighted people might be able to discern its crescent with the naked eye and this is certainly easy to spot through binoculars. Venus dims to magnitude -4.0 by the time it sweeps 8° north of the Sun and only 42 million km from the Earth at its inferior conjunction on the 25th. This marks its formal transition from the evening to the morning sky, but because it passes so far north of the Sun as it does every eight years or so, Venus is already visible in the predawn before we lose it in the evening. In fact, it is 7° high in the east at sunrise on the 22nd, and it only gets better as the month draws to its close. Before Venus exits our evening sky, it meets Mercury as the latter begins its best spell as an evening star this year. On the 20th, the small innermost planet lies 10° to the left of Venus, shines at magnitude -1.2 and sets at Edinburgh’s western horizon 78 minutes after the Sun. By the 29th, it is 10° high forty minutes after sunset and shines at magnitude -0.4, easily visible through binoculars and 8° to the right of the very young Moon. Mars, near the Moon on the 1st and again on the 30th, dims from magnitude 1.3 to 1.5 this month as it tracks from Pisces into Aries. By the month’s end, it lies to the left of Aries’ main star Hamal and sets at our map times. It is now more than 300 million km away and its disk, less than 5 arcseconds across, is too small to be of interest telescopically. The Moon has another encounter with the Hyades star cluster on the night of the 4th-5th, hiding several of its stars but setting for Scotland before it reaches Taurus’ main star Aldebaran. The latter, though, is occulted later as seen from most of the USA. The Moon passes just below Regulus on the night of the 10th-11th and meets the planet Jupiter on the 14th. Jupiter, conspicuous at magnitude -2.3 to -2.5, rises in the east at 21:37 GMT on the 1st and only 31 minutes after Edinburgh’s sunset on the 31st. Now edging westwards above the star Spica in Virgo, it is unmistakable as it climbs through our south-eastern sky to cross the meridian in the small hours and lie in the south-west before dawn. Its disk, 43 arcseconds wide at mid-month, shows parallel cloud bands through almost any telescope, while its four moons may be glimpsed through binoculars as they orbit from one side to the other. Saturn, the last of the night’s planets, rises in the south-east at 03:44 GMT on the 1st and almost two hours earlier by the 31st. Improving very slightly from magnitude 0.5 to 0.4 during March, it is the brightest object about 10° above the south-south-eastern horizon before dawn. Look for it 4° below-left of the Moon on the 20th. This is a slightly-revised version of Alan’s article published in The Scotsman on February 28th 2017, with thanks to the newspaper for permission to republish here. The end of British Summer Time means that we now enjoy six hours of official darkness before midnight, though I appreciate that this may not be welcomed by everyone. The starry sky as darkness falls, however, sees only a small shift since a month ago, with the Summer Triangle, formed by the bright stars Vega, Deneb and Altair, now just west of the meridian and toppling into the middle of the western sky by our star map times. Those maps show the Square of Pegasus high in the south. The star at its top-left, Alpheratz, actually belongs to Andromeda whose other main stars, Mirach and Almach, are nearly equal in brightness and stand level to its left. A spur of two stars above Mirach leads to the oval glow of the Andromeda Galaxy, M31, which is larger than our Milky Way and, at 2.5 million light years, is the most distant object visible to the unaided eye. It is also approaching us at 225 km per second and due to collide with the Milky Way in some 4 billion years’ time. Binoculars show M31 easily and you will also need them to glimpse more than a handful of stars inside the boundaries of the Square of Pegasus, even under the darkest of skies. In fact, there are only four such stars brighter than the fifth magnitude and another nine to the sixth magnitude, close to the naked eye limit under good conditions. How many can you count? Mars is the easiest of three bright planets to spot in tonight’s evening sky. As seen from Edinburgh, it stands 11° high in the south as the twilight fades, shining with its customary reddish hue at a magnitude of 0.4, and appearing about half as bright as the star Altair in Aquila, 32° directly above it. Now moving east-north-eastwards (to the left), Mars is 5° below-right of the Moon on the 6th and crosses from Sagittarius into Capricornus two days later. Soon after this, it enters the region covered by our southern star map, its motion being shown by the arrow. By the 30th, Mars has dimmed slightly to magnitude 0.6 but is almost 6° higher in the south at nightfall, moving to set in the west-south-west at 21:00. It is a disappointingly small telescopic sight, though, its disk shrinking from only 7.5 to 6.5 arcseconds in diameter as it recedes from 188 million to 215 million km. We need a clear south-western horizon to spy Venus and Saturn, both low down in our early evening twilight. Venus, by far the brighter at magnitude -4.0, is less than 4° high in the south-west thirty minutes after sunset, while Saturn is 4° above and to its right, very much fainter at magnitude 0.6 and only visible through binoculars. The young earthlit Moon may help to locate them – it stands 3° above-right of Saturn on the 2nd and 8° above-left of Venus on the 3rd. Mercury is out of sight in the evening twilight and Saturn will soon join it as it tracks towards the Sun’s far side. However, Venus’ altitude thirty minutes after sunset improves to 9° by the 30th when it sets for Edinburgh at 18:30 and is a little brighter at magnitude -4.1. Viewed telescopically, Venus shows a dazzling gibbous disk that swells from 14 to 17 arcseconds as its distance falls from 178 million to 149 million km. Sunrise/sunset times for Edinburgh change from 07:20/16:31 on the 1st to 08:18/15:44 on the 30th. The Moon reaches first quarter on the 7th, full on the 14th, last quarter on the 21 and new on the 28th. The full moon on the 14th occurs only three hours after the Moon reaches its perigee, the closest point to the Earth in its monthly orbit. As such, this is classed as a supermoon because the full moon appears slightly (7%) wider than it does on average. By my reckoning, this particular lunar perigee, at a distance of 356,509 km, is the closest since 1948 when it also coincided with a supermoon. Of the other planets, Neptune and Uranus continue as binocular-brightness objects in Aquarius and Pisces respectively in our southern evening sky, while Jupiter, second only to Venus in brightness, is now obvious in the pre-dawn. Jupiter rises at Edinburgh’s eastern horizon at 04:28 on the 1st and stands more than 15° high in the south-east as morning twilight floods the sky. It outshines every star as it improves from magnitude -1.7 to -1.8 by the 30th when it rises at 03:07 and is almost twice as high in the south-south-east before dawn. Currently close to the famous double star Porrima in Virgo, Jupiter is 13° above-right of Virgo’s leader Spica and draws 5° closer during the period. Catch it less than 3° to the right of the waning earthlit Moon on the 25th. Jupiter’s distance falls from 944 million to 898 million km during November while its cloud-banded disk is some 32 arcseconds across. The annual Leonids meteor shower has produced some stunning storms of super-swift meteors in the past, but probably not this year. Active from the 15th to 20th, it is expected to peak at 04:00 on the 17th but with no more than 20 meteors per hour under a dark sky. In fact, the bright moonlight is likely to swamp all but the brightest of these this year. 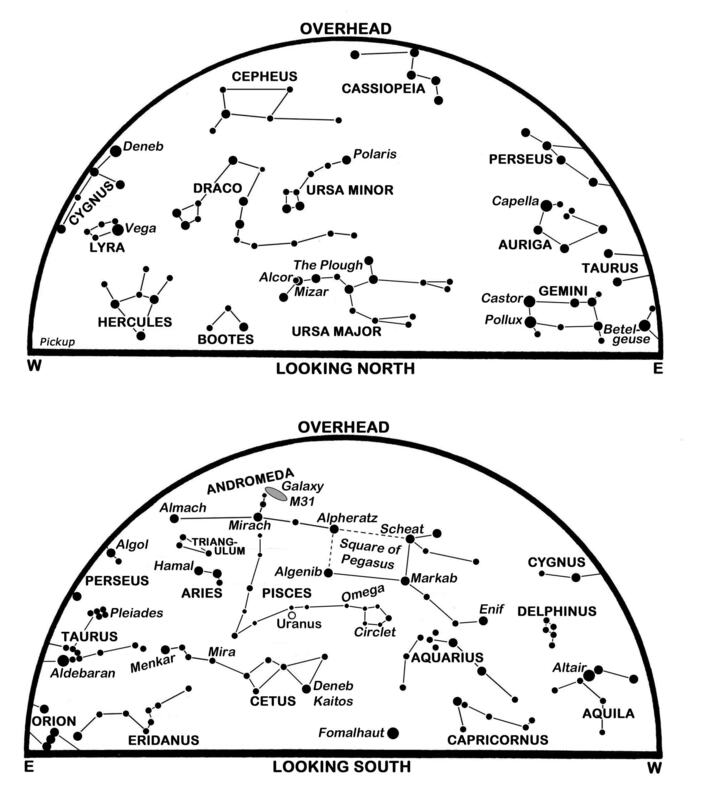 Leonids diverge from a radiant point that lies within the Sickle of Leo which climbs from low in the east-north-east at midnight to pass high in the south before dawn. This is a slightly-revised version of Alan’s article published in The Scotsman on November 1st 2016, with thanks to the newspaper for permission to republish here. With the return of earlier and longer nights, astronomy enthusiasts have plenty to observe in November. As in October, though, the real highlight is the parade of bright planets in our eastern morning sky. The first to appear is Jupiter which rises above Edinburgh’s eastern horizon at 02:04 GMT on the 1st and by 00:35 on the 30th. More conspicuous than any star, it brightens from magnitude -1.8 to -2.0 this month as it moves 4° eastwards in south-eastern Leo. It lies 882 million km away and appears 33 arcseconds wide through a telescope when it stands 4° to the left of the waning Moon on the 6th. Following close behind Jupiter at present is the even more brilliant Venus. This rises 34 minutes after Jupiter on the 1st and stands 5° below and to its left as they climb 30° into the south-east before dawn. In fact, the two were only 1° apart in a spectacular conjunction on the morning of October 26 and Venus enjoys an even closer meeting with the planet Mars over the first few days of November. On the 1st, Venus blazes at magnitude -4.3 and lies 1.1° to the right of Mars, some 250 times fainter at magnitude 1.7. The pair are closest on the 3rd, with Venus only 0.7° (less than two Moon-breadths) below-right of Mars, before Venus races down and to Mars’ left as the morning star sweeps east-south-eastwards through the constellation Virgo. Catch Mars and Venus 2° apart on the 7th as they form a neat triangle with the Moon, a triangle that contains Virgo’s star Zavijava. Venus lies only 4 arcminutes above-left of the star Zaniah on the 13th, and 1.1° below-left of Porrima on the 18th. The final morning of the month finds it 4° above-left of Virgo’s leading star Spica. By then Mars is 14° above and to the right of Venus and 1.3° below-right of Porrima, while Jupiter is another 19° higher and to their right. Venus dims slightly to magnitude -4.2 during November, its gibbous disk shrinking as seen through a telescope from 23 to 18 arcseconds as its distance grows from 110 million to 142 million km. Mars improves to magnitude 1.5 and is only 4 arcseconds wide as it approaches from 329 million to 296 million km. Neither Mercury nor Saturn are observable during November as they reach conjunction on the Sun’s far side on the 17th and 30th respectively. More than 15° above and to the right of Jupiter is Leo’s leading star Regulus, while curling like a reversed question-mark above this is the Sickle of Leo from which meteors of the Leonids shower diverge between the 15th and 20th. The fastest meteors we see, these streak in all parts of the sky and are expected to be most numerous, albeit with rates of under 20 per hour, during the morning hours of the 18th. The Sun plunges another 7.5° southwards during November as sunrise/sunset times for Edinburgh change from 07:19/16:33 GMT on the 1st to 08:18/15:44 on the 30th. The Moon is at last quarter on the 3rd, new on the 11th, at first quarter on the 19th and full on the 25th. As the last of the evening twilight fades in early November, the Summer Triangle formed by bright stars Vega, Deneb and Altair fills our high southern sky. By our star map time of 21:00 GMT, the Triangle has toppled into the west to be intersected by the semicircular border of both charts – the line that arches overhead from east to west and separates the northern half of our sky from the southern. The maps show the Plough in the north as it turns counterclockwise below Polaris, the Pole Star, while Cassiopeia passes overhead and Orion rises in the east. The Square of Pegasus is high in the south with Andromeda stretching to its left as quintet of watery constellations arc across our southern sky below them. These are Capricornus the Sea Goat, Aquarius the Water Bearer, Pisces the (Two) Fish, Cetus the Water Monster and Eridanus the River. One of Pisces’ fish lies to the south of Mirach and is joined by a cord to another depicted by a loop of stars dubbed the Circlet below the Square. Like the rest of Pisces, they are dim and easily swamped by moonlight or street-lighting. Just to the left of the Circlet, one of the reddest stars known is visible easily though binoculars. TX Piscium is a giant star some 760 light years away and has a surface temperature of perhaps 3,200C compared with our Sun’s 5,500C. Omega Piscium, to the left of the Circlet, is notable because it sits only two arcminutes east of the zero-degree longitude line in the sky – making it one of the closest naked-eye stars to the celestial equivalent of our Greenwich Meridian. 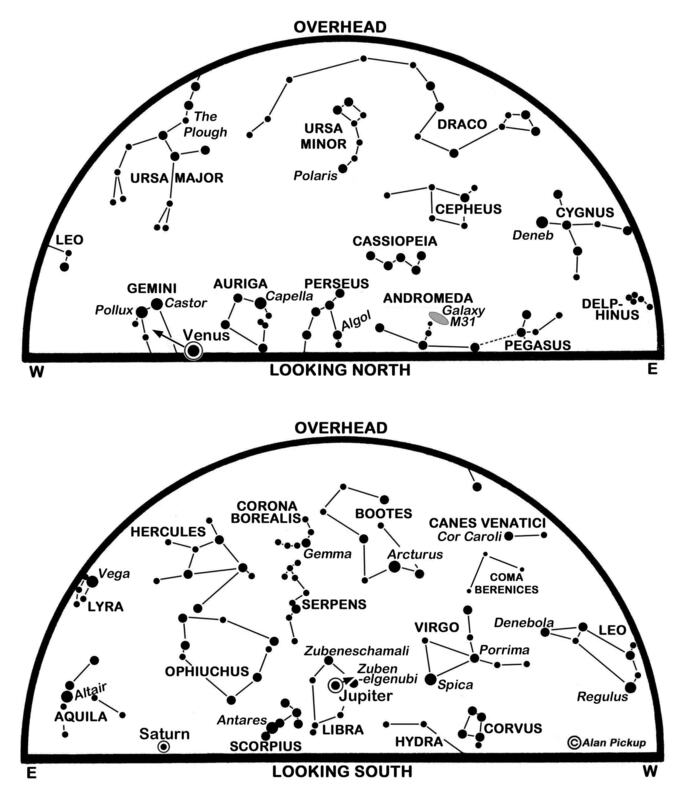 The celestial counterparts of latitude and longitude are called declination and right ascension. Declination is measured northwards from the sky’s equator while right ascension is measured eastwards from the point at which the Sun crosses northwards over the equator at the vernal equinox. That point lies 7° to the south of Omega but drifts slowly westwards as the Earth’s axis wobbles over a period of 26,000 years – the effect known as precession. Below Pisces lies Cetus, the mythological beast from which Perseus rescued Andromeda. Its brightest stars, Menkar and Deneb Kaitos, are both orange-red giants, the latter almost identical in brightness to Polaris at magnitude 2.0. Another, Mira, takes 11 months to pulsate between naked-eye and telescopic visibility and is currently near its minimum brightness. This is a slightly-revised version of Alan’s article published in The Scotsman on October 30th 2015, with thanks to the newspaper for permission to republish here. Journal Editor’s apologies for the lateness of the article appearing here.